This year give your school supplies your own personal twist with these school supply craft ideas perfect for back-to-school. 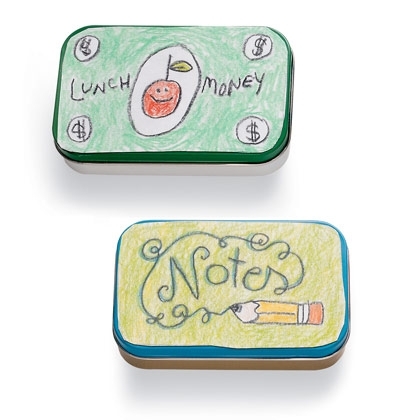 How to make it: Trace the top of the tin onto both the paper and the magnetic sheet, then draw and color a design on the paper. Cut out both shapes, remove the backing from the magnet, and stick the drawing to it. 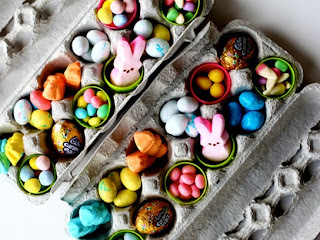 Set the decorated magnet on the top of the tin, then fill the tin with all those very important things. 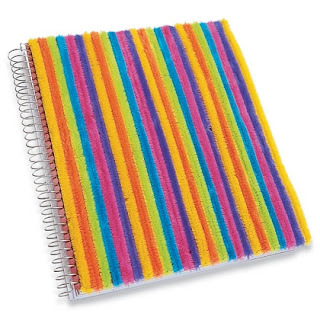 How to make it: Spruce up a plain spiralbound notebook with bold stripes by using tacky glue to stick pipe cleaners (the extrawide, fuzzy type work especially well) onto the cover. Fold the pipe cleaner ends against the top and bottom edges of the inner cover, then conceal them with a glued-on sheet of colored paper. How to make it: Cut 2 rectangles (14 by 3 1/2 inches and 11 by 3 inches) out of contrasting shades of colored paper or card stock. 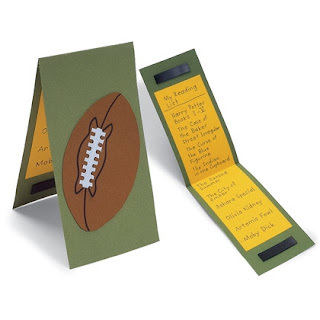 Glue the smaller atop the larger to create a place for your child to keep a running list of the books he reads. Glue matching magnetic strips (sold at most office supply stores) to the ends. 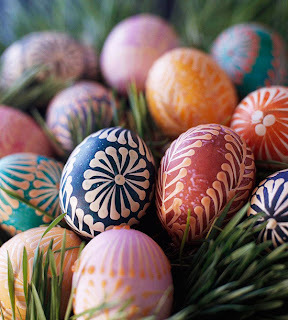 Fold the marker in half and decorate the front flap. 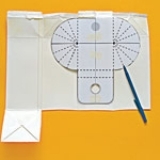 To use the marker, simply fold it over the page you wish to flag; the magnets will hold it in place. How to make it: Cut off the shirt's sleeves, collar, and bottom as shown. 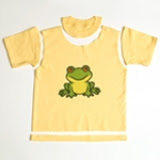 Turn the shirt inside out and sew up the bottom hem (or close the seam with fusible bonding web). If you like, prevent the shoulder seams from unraveling by putting a few dots of fabric glue on each seam end. 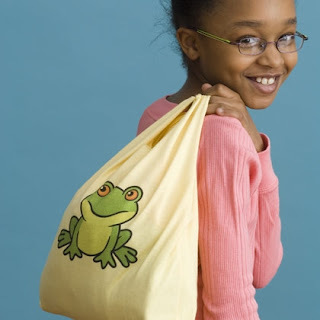 Turn the tee right side out, and it's ready to tote! How to make it: To create the sleeve portion of the holder, cut off the foot of the sock across the heel, and discard it. Then hem the cut edge of the sock tube by turning it under and gluing it in place. Apply more glue inside the hem and sandwich the wrist of the wooden hand between the front and back of the tube. Firmly press the layers together, making sure the sock is sealed all the way across. Cut 2 pieces of magnetic strip to fit across the inside of the sock's open end. Remove the backing and, making sure the strips are aligned, stick them to the fabric. 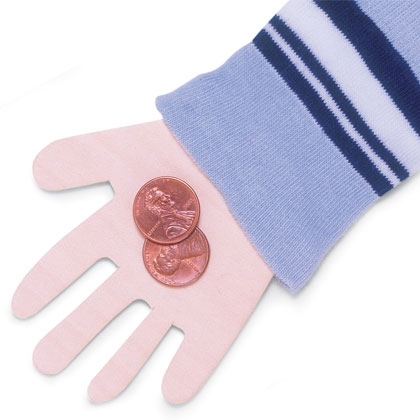 These will function as a clasp to keep the money inside. How to make it: To make a cover, open your chosen book and measure the width and height. 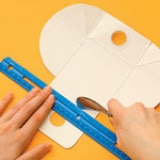 Add one inch to each measurement and cut out a piece of felt with those dimensions. For the inside flaps, cut two additional pieces of felt the same height as the main piece and two-thirds the width of the closed book's front cover. Lay an inside flap on top of each end of the main piece and pin the flaps and the main piece together. With embroidery thread, sew a running stitch about 1/4 inch to 3/8 inch from the edge around the entire border. 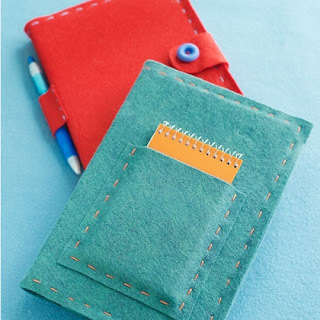 If you like, add one of these extras, Notebook pocket: Before attaching the inside flaps, cut a piece of felt that's 1 1/2 inches wider and 1/2 inch shorter than your notepad. Sew it in the center of what will be the front cover of the book. Faux button closure: Before attaching the inside flaps, cut a strap that's 1 1/2 inches wide and as long as the width of an inside flap. Sandwich the strap between the back flap and the cover and pin it in place, then sew around the entire edge of the cover, as noted above. With scissors, round the end of the strap and sew on a button. Affix a self-adhesive Velcro dot to the strap and the front of the cover. Penholder: After the cover is finished and on the book, cut a 1 3/4-inch square out of felt. 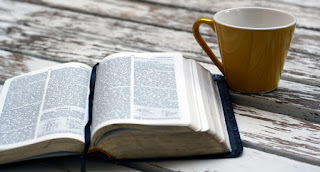 With the book cIosed, lay the square over a pen on the book's spine and pin it in place. Take the cover off the book, then sew on the square. How to make it: Trace a notebook onto a paper bag. Cut out the shape and use a glue stick to adhere it to the front of the notebook. 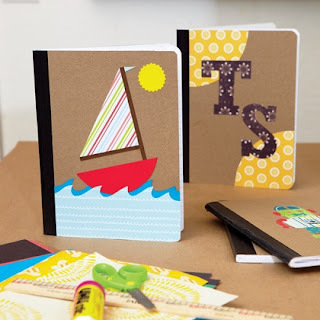 Cut shapes from the decorative papers and arrange them on the notebook, adhering them with a glue stick or glue dots. Helpful Tip: THE 3-D VERSION: To add dimension to your collage, bend up the edges of your shapes before gluing them to the cover. Use this method to create a flower with pop: glue petaled circles in a stack from largest to smallest. MONOGRAM: Top your cover with simple cutouts of your recipient's initials. How to make it: Make sure the container and lid are clean. 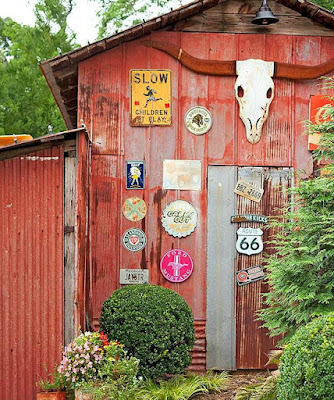 Then use the markers to embellish their outer surfaces with simple, playful drawings. For a fun effect, you may want to decorate the underside so your child will discover the design looking through the empty container when he's finished his lunch. Just remember to print any words backward so they'll be readable. If the drawings fade after multiple washings, simply retrace them. How to make it: Crisscross a dozen or so thin, braided-elastic headbands around the front cover of a three-ring binder, and your child can tuck writing utensils and reminder notes under them, as shown. 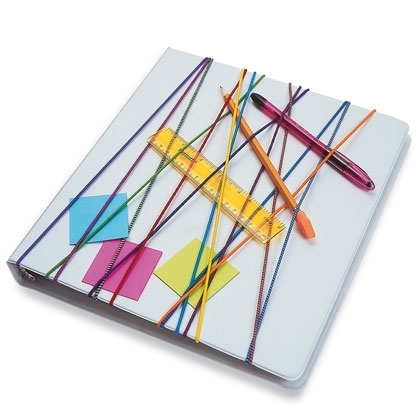 Crisscross a dozen or so thin, braided-elastic headbands around the front cover of a three-ring binder, and your child can tuck writing utensils and reminder notes under them, as shown. 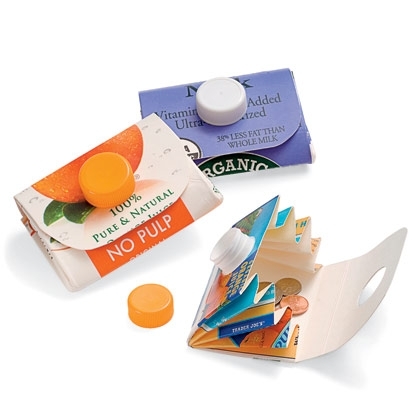 How to make it: Cut open the carton so it lies flat, as shown; put aside the cap for now. Dry the inside with the paper towels. 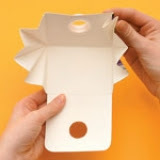 Tape the template on top of the carton so that the top circle lines up with the spout. Mark the outline of the template with a ballpoint pen. 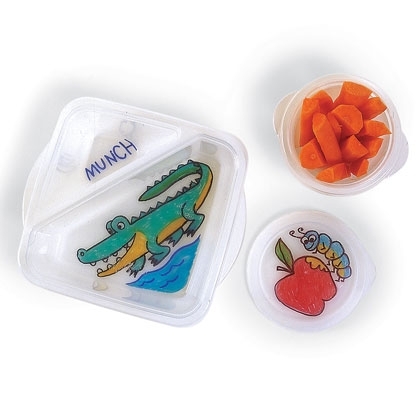 Using firm pressure, trace the lower circle and the dotted lines of the template so that they transfer to the carton. (This will score the lines for easier folding.) A ruler will help you mark the straight lines. Cut out the shape from the carton. Use scissors to cut out the lower circle as marked. (Tip: To make cutting out the circle easier, first make an X with a craft knife.) 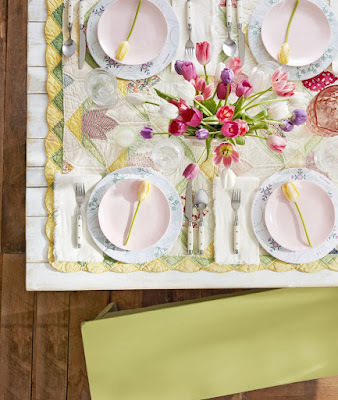 Use a ruler and a butter knife to further score the fold lines. Following the fold lines you marked, create an accordion fold on each side of the wallet. Tightly squeeze the accordion folds. Fold the top flap down, pushing the spout through the hole. Screw on the cap to keep the flap in place.